An adorable Christmas Cartoon, this is sure to delight young children this holiday season! 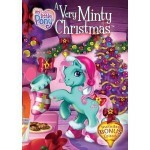 The ponies fro “My Little Pony” learn a valuable lesson this Christmas when Minty accidentally breaks the Christmas Candy Cane that Santa Claus uses to pass through the clouds to Ponyville. Minty is horrified to realize that she has ruined Christmas for all of Ponyville and she has to figure out a way to make it right. This DVD also includes a bonus episode of “Dancing in the Clouds” with Twinkle Twirl and her friend.